Dear readers you are in for a treat! I have been so excited about having Stan Hurd as my guest and looking forward to this post greatly. When I first heard about his books and then read his posts on the lovely Meredith Esparza's site, Austenesque Reviews, I have wished to have him visit. Well, today he is and we are fortunate indeed. Please join me in welcoming Stan Hurd to More Agreeably Engaged. When I began writing Darcy’s Tale, I was comparatively new to Austen, and had no idea that JAFF was even a genre. I was first introduced to Austen by Keira Knightley’s Pride and Prejudice, which, at the time, I found quite engaging. But after I read the novel, and her other novels, and I was pretty seriously hooked. Then a friend gave me the Colin Firth series, and introduced me to the Pamela Aidan books. The first time I read Aidan, I was delighted just to be back in Austen’s world. But a second reading started to expose what were, to my mind, flaws in her interpretation, and I couldn’t finish a third reading. It felt like a friend of mine had been maligned in print, and I wanted to set the record straight. I personally don’t think people make fundamental changes in who they are, so I believed that he had to have been a good guy from the beginning. How, then, to reconcile his actions with that belief: that was my starting point. But the capacity of a man to change himself for the love of a woman is, of course, a matter of debate. I have chosen two parts of my book to share: one where Darcy is usually thought to be uncommonly arrogant, and another where her misreads Elizabeth pretty thoroughly; I’d like to offer them as stepping off points for discussion. Was Darcy really the jerk he seemed at the Meryton assembly? And then, at Rosings, Elizabeth was puzzled, and a little offended, I think, by his silence when he walked with her in the park; so how could moments like that lead him to believe she was “wishing, expecting his addresses”? So I will give you my interpretation, in hopes that it will lead us into a lively discussion of what is right and what is wrong with men…no! I mean what is right or wrong with the idea of men changing deeply through the love of the right woman. The appearance of the newcomers naturally caused a stir and a wave of whispers to spread through the room. And certainly Darcy, given his stature, his fashionable attire, and well-featured face, received his full share of the attention. Unfortunately, that very attention, which for most persons would have been a welcome sign of consequence and notice, served to fix in him the dark mood he had carried in with him; he felt like a caged bear being paraded at a country fair for the peasantry to gawk at. And, even more regrettably, the scrutiny he received created among the revellers a general awareness of his marked lack of enthusiasm for his surroundings; this was soon interpreted as scorn for the company in which he found himself. Such was his mood that when the early smiles and flutterings turned to blank stares and cold shoulders, it brought him, not a sense of his wrong-doing, but a perverse sense of vindication. That they should dislike him was proof of his acuity and insight. Society was the same every where, thought he with some bitterness; well enough, let the cats say what they would—it mattered little. Here, at least, he was not compelled to cater to it. He would never see any of them again in his life, so what did it signify? He was vaguely aware that he was behaving churlishly, and the better part of him felt it, but not so strongly that he was minded to break from the manner of his beginning. “You are dancing with the only handsome girl in the room.” said Darcy, though this was certainly untrue; Bingley was merely dancing with the most handsome girl in the room. But his present mood was such that Darcy was ready to disagree on any and every point. “Which do you mean?” He turned around and saw a young woman seated nearby, happily engaged in watching the dance. He had noticed her earlier, and had resisted the inclination to let his eye linger in her direction more than once during his wanderings, but he would by no means admit as much to Bingley. Her dark eyes, alive with mirth and yet at the same time showing an astute appreciation of all that was passing, had caught his attention particularly. Now, sensing his observation of her, she turned to meet his gaze. Not wishing to see her eyes harden as she recognised who it was that beheld her, or perhaps because his more gentlemanly side felt his general incivility during the evening, he quickly withdrew his own glance. To Bingley he said, “She is tolerable, but not handsome enough to tempt me. I am in no humour at present to give consequence to young ladies who are slighted by other men. You had better return to your partner and enjoy her smiles, for you are wasting your time with me.” Bingley left him with a smile and a shrug of the shoulders. Darcy then glanced cautiously back over his shoulder for fear he might have been overheard; but the young woman had turned away and did not appear to have paid them any attention. He was relieved: ill-humour he would allow himself—open discourtesy he would not. However, had he been able to observe her while he was speaking, he would have seen the young lady’s eyes widen at his ill-mannered and disobliging description of herself. “Miss Bennet, good morning!” he called. “I should have gone back shortly,” she said briefly. “Shall I accompany you?” he asked: always correct, he wished to ensure that she would not be uncomfortable in his company; they were, after all, alone and unchaperoned. “If you wish,” she replied. 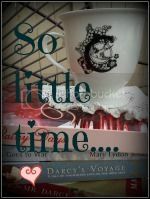 There was a slight emphasis to her tone as she said this, and in this particular response Darcy saw more than acceptance: her answer was actually a tentative invitation that, depending on his answer, would tell her whether he truly wished to be with her, or would as soon go on his way alone. “I should be very happy to,” said he, answering both the spoken and unspoken question. He smiled at her and turned back the way he had come. She gave him a momentary smile in return, then cast her eyes down at the path. They walked together some minutes in silence, enjoying the morning and the fresh spring air. Darcy, conscious of her every movement, was careful to observe her silence; she clearly had come out to enjoy a quiet walk, and he did not wish to draw down her disapproval by disturbing her morning with chatter. “Do you come this way often, Mr. Darcy?” Elizabeth asked after a time. “You, Sir, are Dirks Darcy?’ the lady asked in wonder; her face marked her incredulity. “At your service, Ma’am,” Darcy replied, bowing with a flourish. In this earnest return Darcy could feel that she was sharing something of herself, in answer to his admission of his childhood absurdity; but just what she meant was equivocal; as he thought about it, though, it came to him that she might very well be telling him how they might be together, without interference from ‘unwanted visitors’. He glanced quickly down at her; something in her manner, or perhaps how near to him she walked on the narrow path, convinced him: she was inviting his company, here in the grove. He tried to see her face, but her eyes were modestly cast down, no doubt from the consciousness of her daring, in offering such a bold suggestion. Ok, now it’s your turn. What are your thoughts? Thanks so much Stan for sharing your thoughts and these fascinating excerpts. I'm hooked and can't wait to read more. Thank you most of all for being my guest. Readers, what do you think? Will you take a few minutes to tell Stan Hurd your thoughts? He would love to hear them and as you know, I am always interested in hearing your share in the conversation. There is also a giveaway and it is worldwide! I know that makes you all very happy! 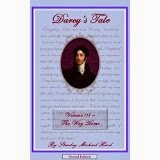 Mr. Hurd is giving away two eBooks of Volume I, Darcy's Tale. Leave your email address in your comment to be entered in the giveaway. It ends on midnight, November 26, 2014. Good luck to all of you and happy reading! I have already read the first 2 volumes so don't enter me into the giveaway - I went to buy the third volume paperback yesterday and it was not available on amazon USA or Canada. I am going to now have a longer wait to finish the trilogy! Hi Vesper, it's Stan. I've been trying for an hour to get my gravatar to work, but WordPress is being mean tonight, so I just have to use the Anon setting. I LOVED all three books in the series. I highly recommend them to any one who is a fan of P&P. Thanks for stopping by and for telling us your thoughts on the books. I always love a romance written by men. They lend a fresh perspective, in my opinion! And to have the brief peek into these stories makes me want to read them even more! I like the way you write! Thank you for the opportunity to win a copy. I have added the three to my TBR list! Stan here; having trouble with my blog ID tonight. Thanks for joining in; glad you liked the excerpts. Good luck! Oh how exciting another opportunity to win book 1 has come along! I was waiting for the series to be finished before starting it (I have memory problems if I read a series too far apart!) so I'm primed and ready to go! Oh sorry, my email is brendapwood at gmail dot com! I hope you’re glad you waited. I just released a new edition of all three volumes in one that’s a better deal than buying the single volumes, but it’s only available in paperback. But all three volumes in all formats have had another complete edit for incorrect Regency usages (tough to get them all, no matter how hard you try). Anyway, I look forward to hearing what you have to say about them! Interesting thought, about Darcy not fundamentally changing. Honestly, I'm not sure what to think about that and haven't sat down and given it much of a mulling over. My gut answer is that I think that people are capable of a lot both for good or bad when a certain motivation is put in place including change as a result of learning (nature vs. nurture, nature and nurture and all that). I saw this in play a lot as a teacher, a social worker and a volunteer at social programs. So, my preliminary conclusion is that I think people can change up to a point for sure if not entirely including our Mr. Darcy. Hi Sophia Rose, Stan again. Sorry to be "Anonymous". By “fundamental changes” I mean in how a person sees the world, what makes right and wrong; they can change their behavior significantly, especially if they hurt someone important to them by they way they have been behaving, but I don’t see that as a fundamental change, necessarily. That is what happened to Darcy, I think. He hurt and angered Elizabeth, he hurt Bingley, and he hurt himself, by being insensitive to how much of an impact he was having on the people around him. But if he was an arrogant twit who hurt people knowingly, I don’t believe he would change into the Darcy who appears at the end of P&P, the one who is worthy of Elizabeth. Thanks for the further explanation, Stan. That makes sense. 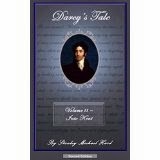 Love reading how you came to write your version of P&P from Darcy's point of view. 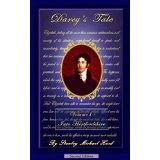 He is a fascinating character who have withstood 200 years of interpretation from readers. I love how how you provided us a glimpse inside his thoughts especially from a male perspective. I really enjoyed the excerpts. I'm glad you completed the series. Looking forward to purchasing your novels and reading them during the holidays. I agree that there are not many male authors who will tackle Pride and Prejudice or other Jane Austen's novels. Thanks for adding in your 'authentic' male perspective. It's refreshing to read about the different interpretation of Darcy. He's an enigma and many authors have taken a crack at solving. Btw, I have your first book, Stan. If I win, is it alright if I exchange it for the second book? If not, please don't enter me for the giveaway, Janet. What are your thoughts on my premise? Was Darcy an arrogant, unpleasant guy, or was he just a clueless and insensitive one (like most of us)? I believe your theory is spot on, Stan. P&P is written from Elizabeth's POV and her opinion of Darcy is based on a short acquaintance where he is not exactly friendly. But after Rosings, she says to Wickham that Darcy was unchanged in essentials, meaning the goodness was always there, she just didn't recognize it. However, we don't know why he acted that way and I am eager to explore your view point through your books. And I am intrigued and excited to view Darcy from a man's perspective. I have added all 3 books to my TBR list and appreciate the opportunity to win the first one. My email is gailwarner AT verizon DOT net. Excellent points! What I found as I went through everything he said and did, was that there were a lot of times that Austen must have known exactly who he was, really, even though she merely sketched him in—but it’s like a study sketch by a master: every nuance is there. I also think we have been biased, probably subconsciously, by the film interpretations. It surprised me to find, as I studied him, how often he smiled at Elizabeth in the book; it’s not something you really visualize him doing, if you’ve watched Firth, and Rintoul, and even Macfadyen, all of whom showed Darcy as a very unsmiling sort of person. Several comments here have touched on the male perspective. Do you think a male can write an emotionally satisfying romance? After all, we approach romantic relations very differently from women. In the Meryton Assembly he is quite uncomfortable being in his new surroundings and coupled with his bad mood, he didn't mean to give offense to the people. He is misunderstood and doesn't bother to correct other people's opinion of him because he doesn't care what they think. I can understand him as I am an introvert and don't know how to mix with new people whom I haven't met before in my life. In the second instance, I think he is a bit arrogant and over confident. He misreads Elizabeth's feelings for him and seemed to be under the impression that she expects his address. Good thoughts, Gail and Sylvia. These are some very interesting points. Thanks for sharing yours with us. Hi Dung, it's Stan again. Nice to hear from you, and thank you; when I was finishing volume I, I was happy with my interpretation, but I really didn’t think a guy’s version of the story would satisfy what had to be a primarily female readership, so I didn’t think much about publishing it. I would remember how Aidan’s Darcy gushed about Elizabeth in both his words and thoughts, and how wildly popular her interpretation was, and my view of Darcy seemed pretty reserved by comparison. But, it was that excessively “metrosexual” view of Darcy that prevented me from wholly warming up to Aidan’s vision of him; no guy I know, or could imagine wanting to know, is like that. So I set out to see if I could do better, and, like I said, I never really thought it would be published. But some friends and family encouraged me to try it, so I went ahead and published volume I. The results surprised and delighted me, and now, a year later, it’s all finished and I’m satisfied—the more so because in the process I have gotten to know a lot of very nice people, like you, and Janet, and everyone on her blog. Thanks so much! I like your thoughts here Stan. I'm glad that you chose to go ahead and publish your work. Thank you. I agree, I'm glad you decided to publish your work. I was trying to recall Aidan's versions. Volume II was a bit over the top and didn't seem believable to me. We all want a Darcy in our life, at least the one at the end of the story so we can have our Happy Ever After. I tend to see both/all sides of things, so I love the relationship of Darcy and Elizabeth with all their misrepresentations and misinterpretations. I like that you are very thorough in your descriptions and thoughts of the characters. I look forward to reading the three volumes of your story :) Thank you, Stan, for your giveaway and thank you, Janet, for your blog. Hi Nicole. I'm happy that you stopped by and left a comment. It is good to be able to see both sides. I appreciate you thanking me for my blog. It has indeed been a very fulfilling experience. I did try to be thorough; maybe I was too thorough, because Darcy’s Tale is twice as long as Pride and Prejudice. Clearly, I don’t have Austen’s ability to convey volumes in a single scene. Good luck on the giveaway! And Janet definitely deserves a thank you for her terrific blog: YAY, JANET! Thank you, Stan! So glad you like my blog! You made my day! Thrilled to hear about the Deluxe Edition, all three paperbacks in one! I've got the e-books (so please don't enter me in the giveaway) but there's nothing like holding and treasuring a physical copy of a favourite book. Thanks for writing this wonderful story, the fresh perspective made all the difference! A delightful read, perfect in every way. I thought the Deluxe edition would make a nice gift for the holiday season. I certainly agree with you about real books; they have been such a big part of my life. It was an amazing thing to see the first volume of Darcy’s Tale in my hand; I imagine you felt the same with From This Day Forward. Glad you popped in, Joana. It's always lovely to hear from you. I would like to read this saga, I've heard beautiful opinions about that! I really want to explore more Mr Darcy's character above all his bechelor years! Thank you Loren, I hope it meets your expectations. Good luck in the Giveaway. I believe that often love is blind, where in we see things that aren't really there merely because we want it to be there. Likewise is the case with Darcy in Hunsford. Your interpretation of what was going on in Darcy's mind is very realistic and believable. People often mock Darcy for being obtuse in not recognizing Elizabeth's dislike for him, but likewise Elizabeth I feel was pretty blind to not realize sooner Darcy's admiration of her, something Charlotte often deduced, and Elizabeth had more to go off of than her friend did. Yes, Elizabeth to me was just as blind as Darcy. Thanks for your thoughts. I agree with you completely. I don't think DARCY was even blind so much as he was mistaken. Since Lizzy was often verbally sparring with him, that could have been mistaken as flirting. DARCY certainly was not used to that type of treatment from a lady. I think even that indicated she had feelings more than she was aware. Yes, Lizzy was just as blind yet she prided herself on being an excellent judge of character. Thanks again for popping in.